Typically you cover an assignment, edit and caption photos, then when all is done, transmit your photos for publication. For me that typically means between three to five photos with the expectation that one to three will be published. Sometimes these assignments are multiple day events so you have to think how your coverage will vary each day in order to keep things fresh. And then sometimes these assignments not only span multiple days, but they are assignments you have covered over multiple years. This years Fleet Week in New York was just such an assignment, one that I've photographed probably 18 times, both in uniform and out, and for the last eight years for the Office of Naval Research. On the first day as exhibitors are setting up and the participating ships begin to arrive I try to make a photo that sets the scene. Not only behind the scenes coverage for ONR, but also a standard Navy shot showing the parade of ships. Last year I was successful on both counts, so this year I spent lots of time and clicks covering the set up of our exhibit. This mostly consisted of Sailors moving boxes, forklifts unloading crates and like. It was dark and not very exciting, so I pulled out the flash and played with rear curtain sync, slow shutter speeds, etc., and did manage to get one frame that was marginal at best. It was published. Last year while walking to Pier 86, home of the Intrepid Sea, Air & Space Museum, to cover our exhibit set up, the USS New York passed by during the parade of ships. I took a few frames and later that evening, almost as an afterthought, decided to caption and transmit that photo. It was published. 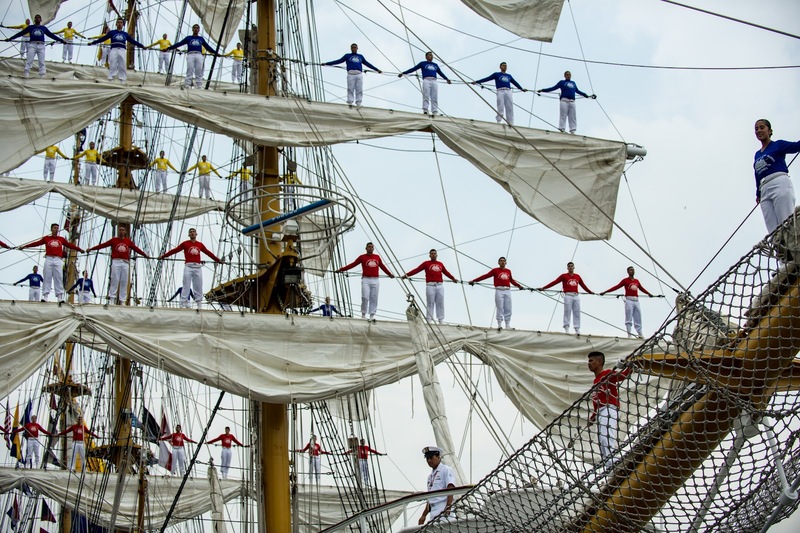 So this year after documenting our exhibit set up I decided I would photograph the parade of ships, which this year included 17 tall ships from numerous countries. For the most part it was pretty standard photographs from the end of Pier 92 and at times felt more like shooting a lineup, then actually doing something creative. 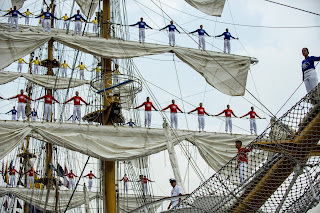 As the ships started to tie up, I was once again on Pier 86 when the Colombian tall ship Gloria was pulling in, I was struck by the sailors aloft in multiple colored shirts. I instantly thought that this was a different picture, a picture that would represent Fleet Week in a different way. So that night as I prepared my photos, it was with high expectations that the photo above would be published. It was different, well composed, spoke to the uniqueness of this year's Fleet Week. I'll never know why that photo was never published and two others were, one mediocre shot from my experimentation and another of the USS Wasp, but that is what keeps me shooting.